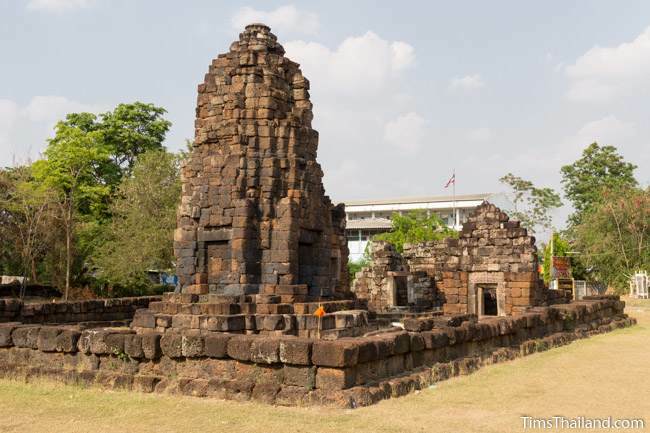 The Bayon-style Prang Ku Chaiyaphum (ปรางค์กู่ ชัยภูมิ) is the most complete Khmer ruin in the province, and a major point of pride for the capital city. It decorates the street signs, the festival honoring it lasts three days, and it's the city's main (essentially only) tourist attraction. 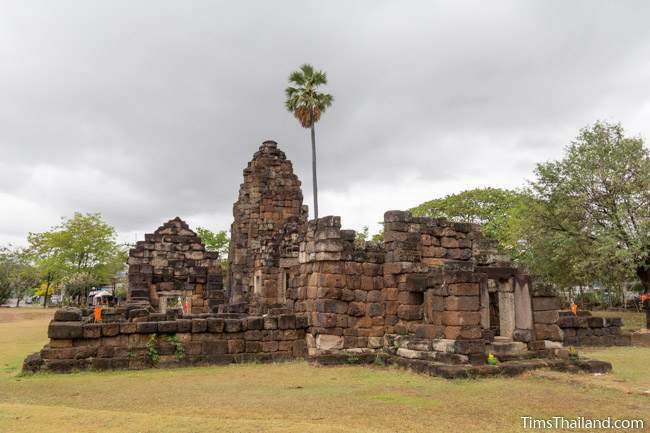 It was built by King Jayavarman VII (r. 1181-1219) as a Mahayana Buddhist temple for one of the 102 arogayasala (hospitals) that he opened across the empire, and it follows the standard design: a small east-facing sanctuary with a single tower, an enclosure with just one gopura, a single "library" between them on the south side, and a pond outside to the north; all built of laterite. 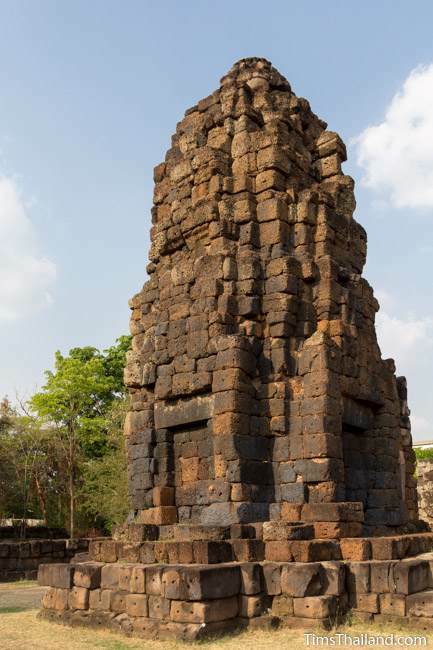 The sanctuary's prang tower stands complete, lotus-bud crown and all; albeit with a rather jumbled appearance. 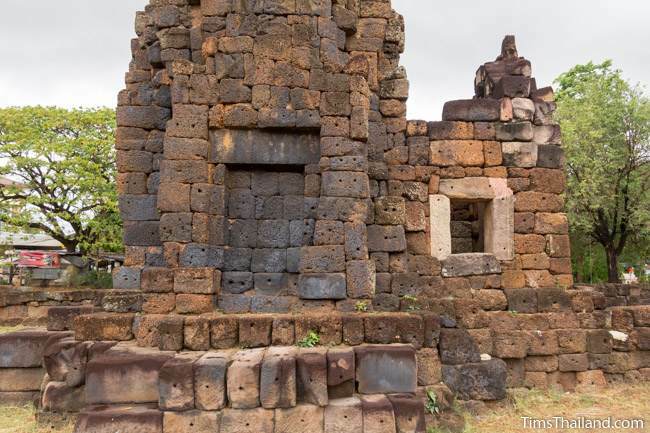 It has a small mandapa at the front, with a window only on the south side, and three false doors on the other sides. 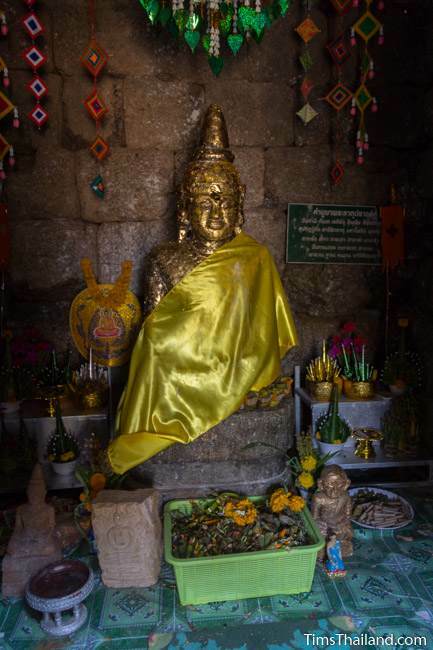 The Buddha image inside is Dvaravati (probably from the 8th or 9th century) rather than Khmer and was brought here in relatively recent times. The sanctuary's front lintel has a Buddha sitting cross-legged atop a Kala face with two very faded (and thus unidentifiable) beings bowing before him while the pediment has a rather large four-armed Avalokiteshvara (the Bodhisattva of compassion) in the middle with two broken beings next to him who appear to be waiing and so are probably devas. The middle portion of the sanctuary's interior lintel is so damaged that there's no way to know the subject, though based on what was typical in that era, the odds are that it had a kala face. The sanctuary's final carving is a lintel above the north false door. 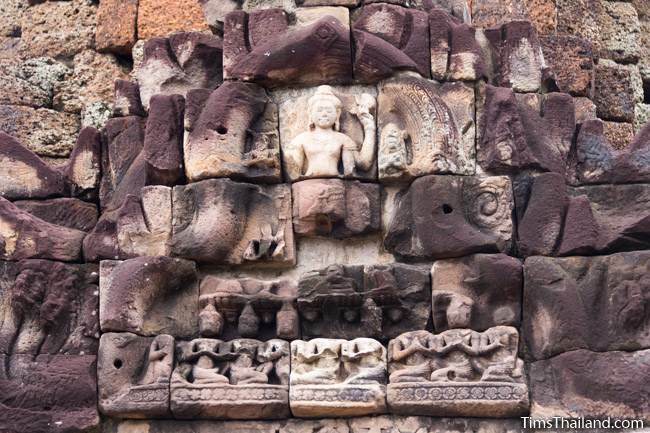 In its center is a Buddha meditating protected by the naga and on the right is a four-armed Avalokiteshvara. 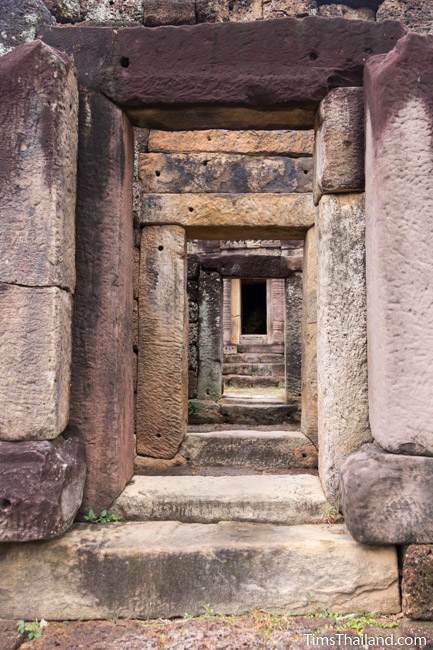 Had the left half of the lintel been finished, there would have had been a Prajnaparamita (Bodhisattva of wisdom), the third of the so called "Buddhist Triad" that features in many of Jayavarman VII's temples. 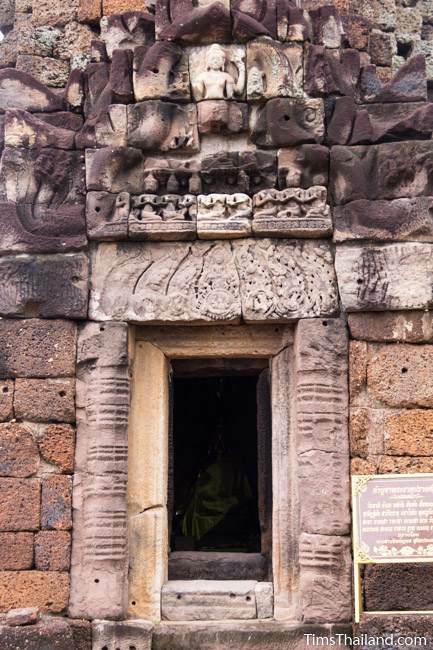 Sanctuary front lintel – Buddha. Sanctuary interior lintel – Subject unknown. 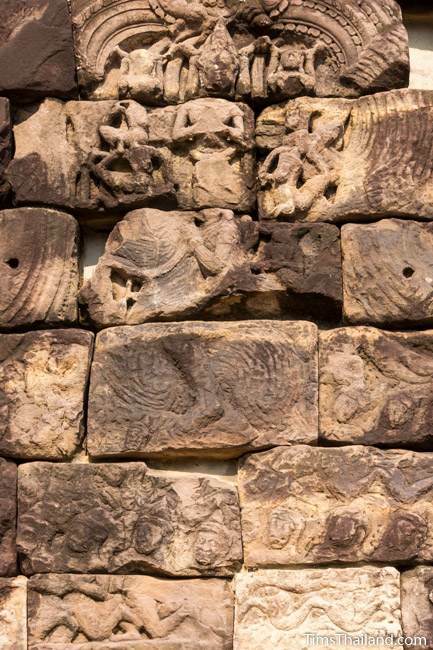 Sanctuary north lintel – The "Buddhist Triad." The carvings have also been put back in place on the "library." 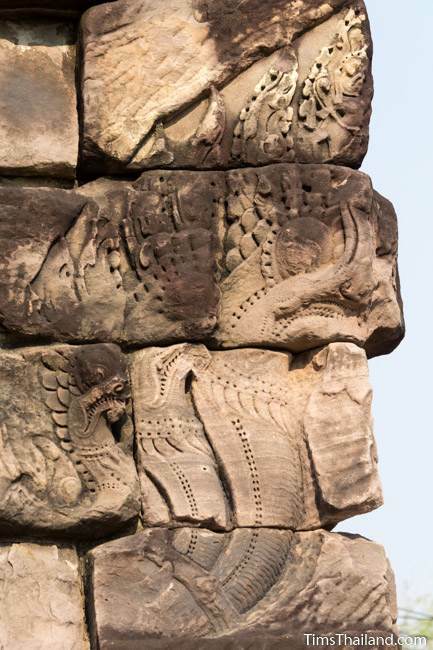 The lintel shows the Churning the Ocean of Milk story while the pediment has the Great Renunciation (when Prince Siddhartha left the palace to begin his religious quest). If you look carefully you can just make out Prince Siddhartha riding his horse. Indra watches over him from above while the faded figures below are devas holding the horse's feet so nobody will hear the departure and try to stop the prince from leaving. (This divine assistance does not happen in all versions of the story.) And like the main sanctuary, there are guardian naga at the corners. Inside is a small yoni now used as a shrine. Library lintel – The Churning the Ocean of Milk story. Library pediment– The Great Renunciation. 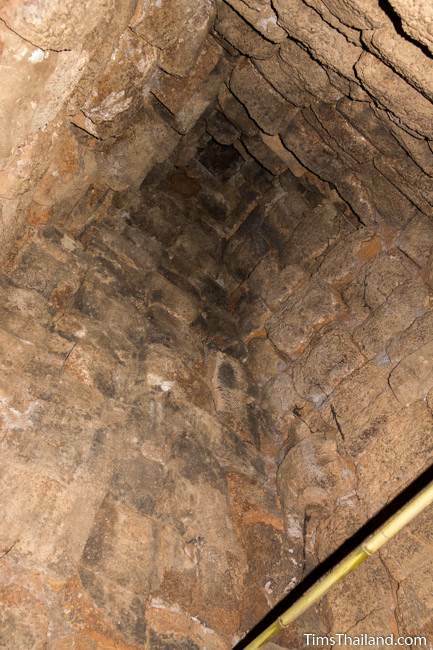 The gopura has a front chamber with windows on the sides (though the lack of sandstone frames might mean they are modern modifications) and two small side chambers. A wide laterite platform connects the gopura to the sanctuary. 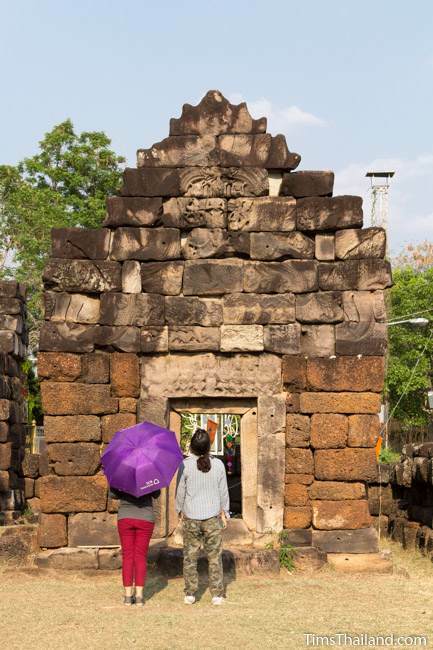 The narrow laterite walkway in front of the gopura was added in recent times because there's frequent flooding here each rainy season. 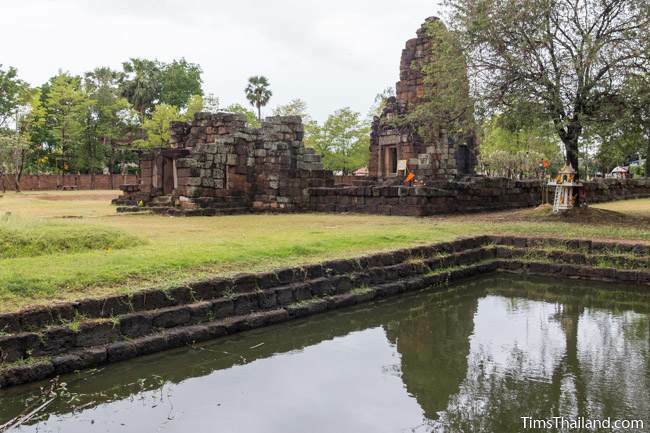 The temple's enclosure is unusually short, though this was apparently the best that could be done with the materials that remained during restoration. 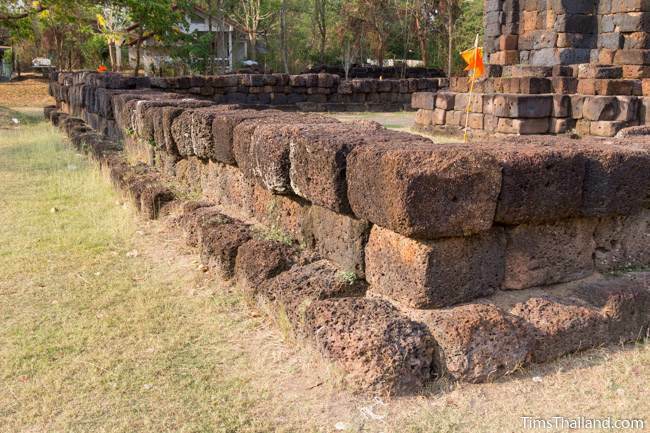 Before restoration, locals had put up a wooden fence since the original laterite enclosure had been removed. 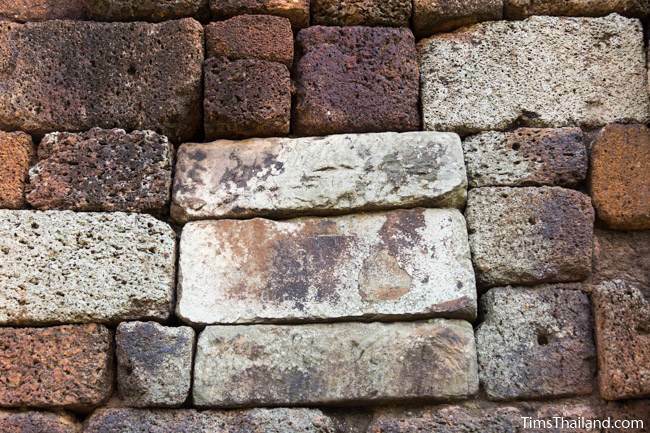 There was also some compromise made during restoration to each of the buildings; you will see sandstone blocks where the originals were laterite. 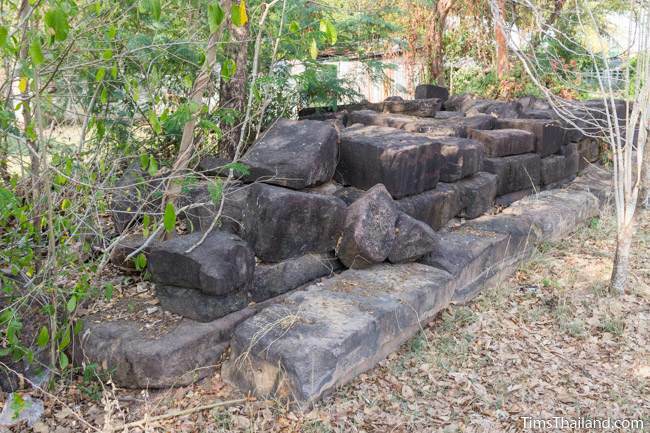 Outside the enclosure is a laterite-lined pond and to the west of it is a pile of sandstone blocks not used during the restoration.